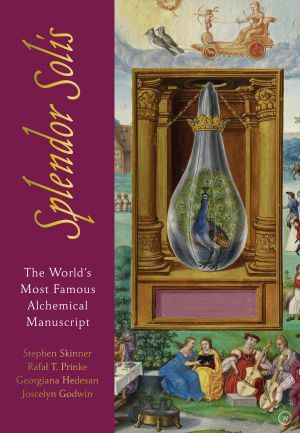 The only high-quality yet affordable edition available of the classic alchemical manuscript Splendor Solis, described as “the most magnificent treatise on alchemy ever made”. Includes up-to-date commentary from experts in the field and a modern translation of the 16th-century text. Category: Ancient Wisdom, New Releases Tags: Alchemy, manuscript. A magnificent edition of Splendor Solis for all those interested in alchemy, magic and mysterious manuscripts. Popularly attributed to the legendary figure Salomon Trismosin, Splendor Solis (‘Splendour of the Sun’) is the most beautiful alchemical manuscript ever made, with 22 fabulous illustrations rich in allegorical and mystical symbolism. The paintings are given a fitting showcase in this new Watkins edition, which accompanies them with Joscelyn Godwin’s excellent contemporary translation of the original 16th-century German text, as well as interpretation from alchemical experts Stephen Skinner and Georgiana Hedesan, and from Rafał T. Prinke, an authority in central and Eastern European esoteric manuscripts. Stephen Skinner explains the symbolism of both the text and the illustrations, suggesting that together they describe the physical process of the alchemical transmutation of base metal into gold. Rafal T. Prinke explains the theories about the authorship of both text and illustrations, discussing Splendor Solis as the turning point in alchemical iconography passing from the medieval tradition to that of the Baroque and the reasons for the misattribution of Splendor Solis to Poysel and Trismosin. Georgiana Hedesan looks at the legendary figure of Salomon Trismosin and his creation by followers of Theophrastus Paracelsus as part of an attempt to integrate their master in a lineage of ancient alchemical philosophers. The images are taken from the British Library manuscript Harley 3469, the finest example of the Splendor Solis to survive.